The last few years I've not been able to get home for Christmas. And I've gone to friends or neighbors and it's been fun. But this year I thought I'd do something different. For Thanksgiving one of the area restaurants closed for business and instead invited anyone without a place to go for Thanksgiving to come spend it with them and have Thanksgiving lunch. One of the people who went mentioned in the news report that he was new to the area and it was the first time he felt like he was home. And, not even gonna lie. It made me cry. I so remember being in that spot. I have absolutely no idea if there will be any interest but I thought I'd check and see. Might be fun, right? There are a number of restaurants in the area open for Christmas dinner. We'll just pick a place and time and all meet up for some noms. I was thinking 4-6pm or thereabouts. 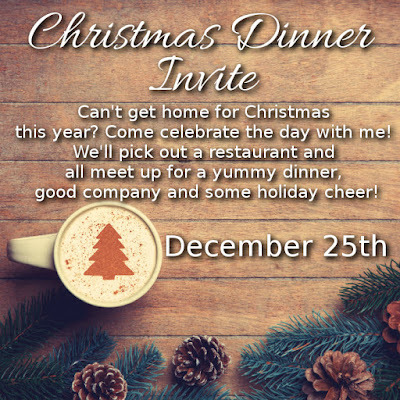 Christmas dinner will be on me so please don't let financial concerns keep you from joining in. If yall have friends or family in my area let em know. Also, if yall see it, any public servants that have to work Christmas. If yall are on break around that time you are of course welcome as well. You don't have to be a blog follower to join in. It's really open to anyone. If you'd like to come just email me acade29@gmail.com or message me on the blog's FB page.